Born in Philadelphia in 1915, and dead too early in New York in 1959, Billie Holiday became a legendary jazz singer—even mythical. With her voice even now managing to touch so many people, we follow a reporter on the trail of the artist on behalf of a New York daily. Beyond the public scandals that marred the life of the star (alcohol, drugs, violence...), he seeks to restore the truth, revisiting the memory of Billie. Through this investigation, Mųoz and Sampayo trace through the undertones of racism and in the wake of the blues, the slow drift of a singer who expressed the deepest emotions in jazz. By internationally renowned Argentine artists, featuring Mųoz' strikingly raw heavy blacks, this is not just a biography but a spell-binding art book tribute. Ziggy Stardust, Aladdin Sane, The Thin White Duke: David Bowie had an extraordinary talent for reinvention. But at the beginning of his career, he made the most significant transformation of his life: from "David" to Bowie. In 1969, shortly after the release of his first hit single, David and his girlfriend Angie move into Haddon Hall, a sprawling Victorian villa in the London suburbs. Part commune, part creative hub, the house becomes home to a community of musicians, hippies, and hangers-on. As egos clash and parties get out of hand, David keeps writing: "Changes," "Kooks," "Life on Mars"—songs that will propel him to global fame. Charting Bowie's personal life, the development of his music, and the transformation of his image, Haddon Hall is an evocative portrait of a young artist presiding over a musical revolution. Before she was the legendary Mama Cass of the folk group The Mamas and the Papas, Ellen Cohen was a teen girl from Baltimore with an incredible voice, incredible confidence, and incredible dreams. She dreamed of being not just a singer and not just a star—a superstar. So, at the age of nineteen, at the dawn of the sixties, Ellen left her hometown and became Cass Elliot. At her size, Cass was never going to be the kind of girl that record producers wanted on album covers. But she found an unlikely group of co-conspirators, and in their short time together this bizarre and dysfunctional band recorded some of the most memorable songs of their era. Through the whirlwind of drugs, war, love, and music, Cass struggled to keep sight of her dreams, of who she loved, and most importantly who she was. An illustrated A to Z, celebrating the unparalleled artistic impact of cultural icon Prince, this decidedly not-for-kids book celebrates the many faces and facets of the legendary musician, entertainer, and pop culture icon. From "Alphabet Street" (the first single off his iconic Lovesexy album) to Jay Z (Tidal being the only place to stream his music on his passing), Prince A to Z is densely packed with everything you need to know about the pop and rock legend—from the greatest hits of trivia to the most obscure B-side facts. Prince's extraordinary cultural significance was highlighted by the worldwide outpouring of love following his tragic passing in April 2016. A huge influential source to many in the fields of music and art, Prince towers as a cultural figure of the twentieth (and into the twenty-first) century. Celebrate his enormous life in this fun, pop-cultural book! 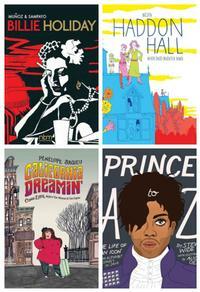 Any singers or musicians you would especially love to read a graphic novel biography about? Let me know in the comments! 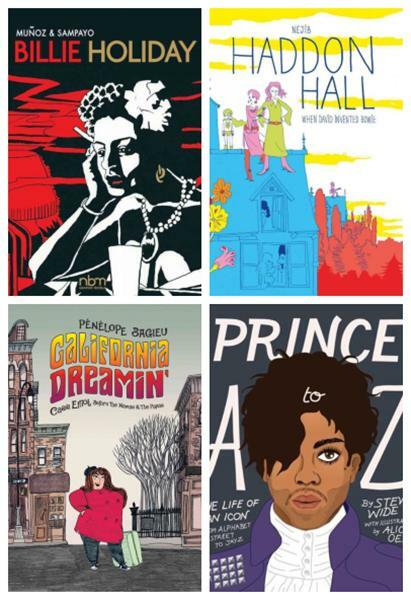 Add a Comment to Explore the Lives of Famous Singers in Graphic Novel Biographies!